The arrival of growing season warmth signals great things, not least the return of luscious abundance and rich pickings. It’s wonderful to be out on the plot – in T-shirt rather than winter coat – busying oneself with all those essential but immensely pleasurable jobs that keep the harvests a-coming. The extra warmth isn’t without its challenges. Heat, along with bright sunshine and low humidity, increases evaporation of soil moisture and water loss from plants, placing a renewed emphasis on conserving this most precious resource. Thankfully steps taken now will go a long way to easing the strain later on in summer, when temperatures turn from warm to hot and it can seem like you’re constantly chasing your tail keeping crops hydrated. The golden rule for any gardener is to feed your soil. Show it some love and it will reward you with bigger, better harvests! Any soil – from free-draining sandy soil to heavy clay soil – will benefit from generous applications of well-rotted organic matter, which as well as gently feeding crops will dramatically improve the soil’s ability to retain moisture. What you add is dependent on what’s available locally. Some organic soil improvers are higher in nutrients than others. High to medium-fertility improvers, such as worm compost or garden compost, are best added during the growing season when the nutrients contained within them will be taken up immediately by the growing plants. Low-fertility soil improvers such as leafmould can be added at any time. Other lower fertility soil improvers include compost sourced from green waste recycling centres, plus straw, bark chips and shredded prunings, which should be left on the soil surface as a mulch. Additional medium to high-fertility soil improvers comprise spent mushroom compost and any of the herbivorous animal manures (applied only at the well-rotted stage). Do not scrimp on organic matter. Layers up to 10cm (4in) deep will give the soil a real boost, increasing its organic content, which in turn improves its ability to soak up and retain soil moisture while allowing any excess to freely drain away – it really is the perfect Goldilocks ingredient! Many gardeners will prefer to dig the organic matter in. Try to retain the organic matter within the top 20cm (8in) of soil, because this is where the roots of your crops are. If you practice no-dig gardening then apply organic matter little and often, leaving it on the soil surface for the worms to dig in for you. As well as improving water retention by incorporating organic matter, the water-wise gardener redoubles his or her efforts to lock in the wet stuff once the ground is moist; a decent mulch will see to this. Mulches are materials laid over the surface of the ground to suppress weeds, slow evaporation and, in the case of organic mulches, slowly feed the soil and improve its structure. Low-fertility organic mulches such as those mentioned above are usually used, as are grass clippings. The primary focus in the short term is to give weeds a hard time and keep the soil, in summer at least, cool and damp. By creating a spongy texture, organic mulches help the ground to absorb rain more easily, reducing runoff in heavy showers and thereby improving its ability to recharge moisture levels after a spell of dry weather. Lay your mulch anywhere between 2-10cm (1-4in) thick, taking care not to swamp plants. One obvious way to conserve soil moisture is to remove any weeds, particularly deep-rooted perennial weeds. The more plants drawing on the soil’s reserve of moisture, the quicker it will dry out, so by removing all plants except those you’re trying to grow, the longer that soil moisture will last. Annual weeds and the foliage of perennial weeds may be left on the soil surface to shrivel in the sun’s heat. Leaving them like this effectively creates another mulch. One word of caution, though: if it’s cool and cloudy, some weeds have the tendency to re-root, taking you back to square one. Only leave weeds on the soil surface if you have properly severed the roots, or if the weather is sunny, hot or windy enough to desiccate the weeds. Otherwise pop them onto the compost heap. If you want to experiment with preserving soil moisture further, there are some ingenious solutions practiced by dryland gardeners. Lateral thinking can pay dividends. I’m sure some of you will have some equally ingenious ideas for improving the moisture retention of soil. Please share your suggestions below and between us we’ll make life a lot easier for our crops – and us! "Thanks for the tips. There are no shortage of weeds in our garden. This Spring I started to leave them hoping they'd make themselves useful as mulch which I'm happy to read isn't a terrible idea. We have used clean straw from a stable in the past which worked well enough but to get a thick cover it was too difficult enough to the garden. Hadn't thought of grass clippings. That would be ideal as plenty of grass is nearby. 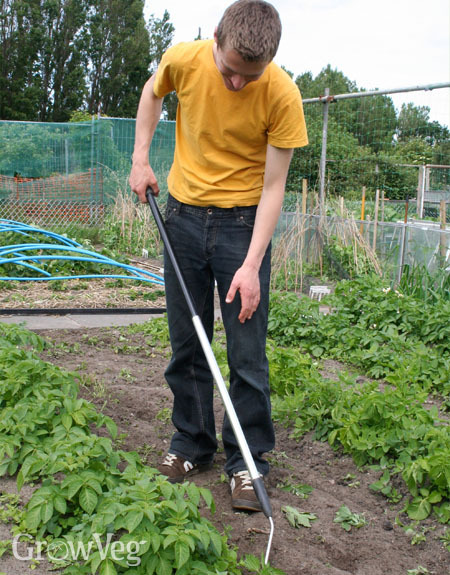 Less weeding and watering is a goal worth working towards. " "Hi Daniel. Good stuff - yes, definitely worth working towards a less watering, less weeds goal - it's achievable!"